The development of the crisis in Belarus has slowed down and the macroeconomic situation has been temporarily balanced. The state program of privatization struggles to achieve its goals because of the lack of buyers but the foreign trade balance is improving because Belarusian goods are relatively cheap. The government failed to adopt market rate for foreign currency exchange despite calls from the business community and its own ministries. More importantly, the government apparently has no robust plan to reform the economy. Exchange rate. The government appears to have abandoned its plans concerning the revitalization of the foreign exchange market in the near future and bringing the official exchange rate to the market level. Moreover, to date, the preservation of restrictions on the free access to the foreign currency for importers and the public began to be openly considered by the authorities as an important factor of improving the foreign trade balance and preservation of the gold and foreign exchange reserves. Currently, the non-cash foreign currency market has split into a number of interdepartmental centers of foreign exchange allocation. Moreover, the right to buy foreign currency earnings flowing to the accounts of accountable exporters is distributed among the importers – members of a certain department (ministry, konzern). In case if the department does not have large enterprises receiving currency earnings in its subordination (as, for example, in the Ministry of Energy), its importers will have problems with the payment for import, regardless of the degree of its criticality (the example of “Belenergo” unable to pay its relatively small debt in the amount of 53,5 million USD to the “Inter RAO UES” is very illustrative). Organizations that are outside the state system of economic management can buy foreign currency from banks at the official exchange rate of +/- 2% (the banks offer this option only to very large customers or affiliated entities) or on the basis of bilateral deals with non-state exporters (based on the actual rate of 6800-7200 Br/USD with the extra payment added to the official exchange rate according to a certain scheme). Inflation. In June the fight against inflation continued by means of administrative resources (“untwisting” of the petrol prices by the President, forcing the retailers to lower the prices and discounts for certain categories of citizens). In general, in June we can expect some deceleration of inflation, although its absolute indicator remains significant (for the first six months of this year the inflation is expected at the level of 33-34%). As a measure for prevention of the trade deficit due to the disparity of prices relative to neighboring countries, the Government introduced restrictions and even bans on the export of certain groups of goods outside the Customs Union (petrol, tobacco, certain foods, refrigerators, etc.). We can say that there are no significant shortages of goods in Belarus yet, but as far as some commodity groups are concerned (cement, coffee, cocoa, meat and dairy products) there is a marked narrowing of the range of products and the decrease of the saturation of the market. It is caused both by the deterioration of conditions for importers and the priority export of domestic products to Russia. Trade balance. As for the balance of the foreign trade, the most acute problem of the Belarus economy, there was a significant improvement of its dynamics (surplus in May in the amount of 154,4 million USD, which happened for the first time in 1,5 years). The mentioned dynamics is driven by both the devaluation of the national currency and the improvement of the external trade conditions in the mineral products trade (almost 33% of the total exports). Foreign loans. In order to increase the size of the gold and foreign exchange reserves (GFER) to a level that ensures sustainability of the economy, the Government continued implementation of measures aimed at attracting external funding. On June 21 Belarus received the first tranche of the Anti-crisis Fund EAEC credit in the amount of 800 million USD from the 3 bn credit line. This amount has been fully transferred to the GFER and was not used for interventions in the foreign exchange market. The next tranche of the credit in the amount of 400 million USD will be received in September 2011 in case of implementation of the agreed measures. The prospects for obtaining assistance from the IMF are still hard to assess: the funding is possible only in case of implementation of the tightly controlled structural reforms. A measure to increase the loyalty of the IMF can be the decision on the establishment of the Bank for Development of the Republic of Belarus. According to the Decree of Alyaksandr Lukashenka the Government and the National Bank should in a 3-month period determine the list of assets of the state banks to be transferred to the Bank for Development (funds previously allocated under the funding of state programs), and the appropriate procedure for their transfer. During this period, the procedure for restructuring the transferred assets shall be approved and the new mechanism of funding of the state programs shall be submitted for approval. The establishment of the Bank for Development should clean up banks’ balance sheets of the non-performing assets and make the monetary policy of the state more transparent through the elimination of the quasi-fiscal financing. Privatization. The privatization process in June proceeded slowly. It is known about the sale of several small manufacturing and transport companies for the total amount of about 3 million USD. At the same time, the auction for selling 10 medium-sized state-owned enterprises ended in vain due to lack of applications from potential buyers. At the end of the month the Government announced its intent to conduct the IPO of “Belaruskaliy”, “BelAZ” and “BelarusBank” shares. This may prove the management’s desire to increase the real interest in the Belarus assets from the non-Russian investors (primarily from China) and start the auction aiming at raising the initial price set for the Russians. A similar situation is with the “Beltransgas”, about which there are Government’s hints about Venezuela’s interest in this asset. Banking. Despite the decline due to the devaluation of the assets of banks from 48,1 to 36,3 billion USD in the equivalent, the situation in the banking system remains relatively stable and is characterized by a low level of troubled debts. However, a particular threat is the further reduction of population’s deposits (which is partially balanced by a lowering credit demand in the economy as a whole), as well as the high level of debt of the National Bank to commercial banks. In ruble terms, the value of claims of commercial banks to the National Bank as of June 1 totaled 33,6 trillion Br (6,8 billion USD), exceeding the country’s gold and foreign exchange reserves. The National Bank will certainly seek to roll over this debt as it is unable to timely repay it. In general, the banking market of Belarus is significantly shrinking and losing its investment attractiveness. Interesting in this context is the invitation for banks to participate under the government guarantees in the provision of soft loans to agricultural enterprises within the 9 state programs with the reimbursable from the state budget lost revenue. Theoretically, such activity would help to minimize the losses from the shrinkage of the market, but in terms of the immature compensation mechanisms it shall increase commercial risks. By the end of the month it became clear that the Government embarked on the classical deterrent (restrictive) policies. GDP growth. The forecasts of the annual GDP growth were lowered to 4-5% (in the worst case scenario even up to 1-3%), the program of preferential construction was reduced (the volume of housing construction through the use of budget funds in 2012 is expected to decline by 55%), the emission lending to the economy was suspended, the public sector wages and social payments were frozen (there is an increased targeting of social assistance). 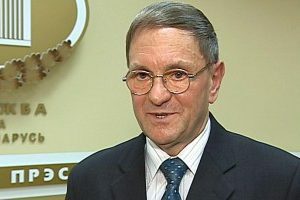 According to the released list of economic policy measures the Government of Belarus is committed to perform the hard limiting of the budget deficit, as well as preserve until 2013 of the proportion of expenditure on salaries in the budget expenditures at the level of 2011, increase the compensation of utility and transportation costs by the population, reduce the net lending of the state programs to the level of 1% of GDP by 2013, define the refinancing rate at the level of the annual inflation etc. All these measures shall certainly help to stabilize the economic situation in Belarus; however they will predictably lead to the fall in GDP, unemployment, freezing or even lowering of population incomes. There is a danger that the growth of these problems will roll back towards populism, with the active use of emission credits in the public sector of the economy. Prospect of reforms. In the near future it is unlikely to expect significant changes in the Government policies or the emergence of new large-scale reform programs: the prevailing view is that all possible measures have been already taken and there is only the need to wait for positive results. The main work shall be done in the format of monitoring the situation and responding rapidly to acute problem situations (finding funding for the harvesting campaign, strengthening targeted social assistance, stimulation of the creation of new jobs in the private sector, administrative price regulation, provision of goods markets with lacking positions). The task of reviving the foreign exchange market is postponed at least until fall, while there is a fundamental view that improving the dynamics of the balance of payments will push the market price down to the official level. In this format the economy can function for several months, but in the longer term perspective such system is unstable due to its inherent significant imbalances (in fact, such a system is repressive in relation to the exporters and the private sector as a whole). The major privatization deals in the next month shall only be possible if very favorable conditions are proposed to Belarus. 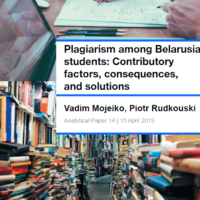 This material was prepared by Belarus Digest on the basis of materials provided by Belarusian Security Blog, operated by a group of young professionals in Belarus analyzing current political, economic and security issues. Last Wednesday, the seventh silent protest action was held in Belarus. Many political analysts welcomed the new format of expressing citizens' anger, yet we need to be cautious with being too enthusiastic about the new movement. The protests have swept across the entire country – unprecedented in this regard and comparable only with the protest movements before the breakdown of the Soviet Union. There is no doubt about the sincerity and courage of the protesters. Yet is it enough to change the nation? Hoping that some spontaneous movement can later self-organize and bring about democratic changes is wishful thinking. The crowd is blind, even if it is a crowd of educated people with good intentions. There is an essential difference between a crowd of discontent citizens and organized demonstrations and rallies. Last action has lost some drive compared to earlier actions, and still it was impressive. However, without proper organization and program, the actions have little promise. In fact, they can easily help to create chaos. And this chaos is much more likely to be used by the regime rather than the democratic opposition. The movement can be effectively highjacked by some people or groups from the regime who will have an explicit agenda and robust organizational structures at their disposal – everything the democratic opposition does not have at the moment. The resulting changes in Belarus will be not toward a democratic regime, but from today's sultanistic regime toward authoritarianism. In fact, this is how sultanistic regimes always evolve, as argued by the scholars of these regimes Juan Linz and Alfred Stepan. Some adverse effects have already emerged. Up to 2,000 people were detained at silent actions in June and July. The reaction by the government has proved not only its will to stop protests but also an increasing trend of law-breaking by the police and security agents. Lukashenka has many legal or seemingly legal instruments at his disposal to persecute the opposition, and so far the regime has tried to adhere to the legal framework. However, now the regime is increasingly breaking its own rules. In June protesters were primarily detained by people with at least some signs of belonging to government agencies. In July the government resorted to the help of some plain-clothed men on cars without registration plaques who often kidnapped anyone suspicious in the place of protests. Heinrich Boell's famous story “My sad face”, telling how lack of happiness demonstrated by a main character results in his detention, became reality in Minsk. In Belarus, even a suspicion that a person is going to applaud or otherwise display his discontent with the regime – for instance, by silently standing on a square – could trigger a brutal attack by anonymous thugs sometimes followed by disappearance for a few hours. Later the victims are 'found' in jails and courts. The detentions of journalists have also reached unprecedented scale. Until now, a journalist ID was rather efficient at providing some security at rallies. But at the silent actions the government forces break this rule as well by detaining dozens of journalists. The result is the emerging atmosphere of lawlessness. After all, no one can be sure that if he resists kidnapping by some unknown people in the center of Minsk today he will not end up in a courtroom accused of resistance to the police. If he obeys the kidnappers, on the other hand, he will also end in the same institutions accused of a milder offense – like obscene swearing. Another novelty of silent actions is the immense amount of apparently false evidence given by the police in order to convict the demonstrators. 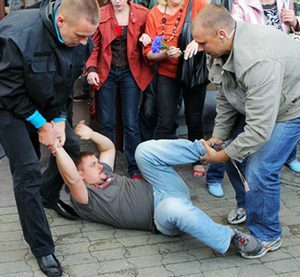 It is fatal to the already questioned integrity of the Belarusian police especially because the absolute majority of protesters are not affiliated with opposition or political movements in any way. The plain clothed men detain genuinely ordinary citizens. The iron-fist policy bordering on lawlessness is the regime's strategy to deal with political and social issues. Another recipe used by the government to solve economic problems – by decreasing the people's income – has also apparently worked. In May, for the first time since January 2010, the balance of payments became positive. The stabilization is going on and the people are forgetting their grievances and getting used to lower living standards. This means working for less money. It helps the government to decrease the price of products that are being exported by the country and to increase national exports. This also prevents Belarusians from buying now more expensive imported products and solves the problem of foreign trade deficit. The Belarusian regime can turn impoverishment into a more gradual process by getting new foreign loans, abolishing many components of the welfare system, reducing subsidies to unprofitable enterprises, and selling state-owned assets. The economic situation will considerably deteriorate, yet there are no grounds to anticipate any collapse or a political revolution yet. After all, as Dzmitry Isajonak wrote in his blog, these troubles may be resolved by non-political means as well, like mass criminalization or labor migration. Ironically, some grotesque form of Chinese model so dreamed of by the Belarusian establishment may emerge. The wages are already far below the USD 500 per month level even in the capital, while outside Minsk even USD 200 are considered to be good. Do not forget, that level is not new for the country where people used to earn as much money just some years ago. Furthermore, now the Belarusians have certain savings and property bought in the recent years of relative prosperity. That will help them to amortize their fall into poverty. And seeing no political alternative they most probably may prefer just to survive – by going abroad for work, engaging in illegal business activities or simply staying at home – rather than risking going to the streets to change the ruler.